three weeks ago we picked up half a bushel of apples after a weekend in the mountains. strangely, it was snowing that morning. the first snow i’d seen in years. we buy our apples from an orchard in rabun county, up in the georgia mountains. they have massive pigs and fields of blackberries and pumpkins everywhere, along with all the cheesy goods like 50 flavors of hot sauce and little bags of polished rocks. i love going there. 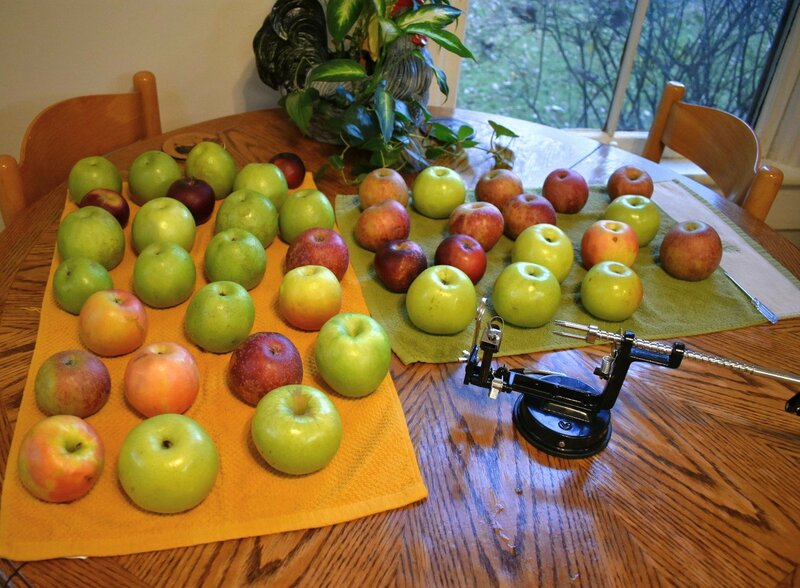 half a bushel of apples is a lot of apples, like 60 apples. the closest thing we have to a root cellar is our fermentation chamber (an old chest freezer converted with a temperature controller), which is where the apples lived until yesterday, when they were booted out by two 3-gal carboys full of homebrew. it was time to process them. i turn the apples into apple butter. this is my third year carrying out the tradition. my first year, i made a conventional butter that contained more white sugar than apples. it tasted great! 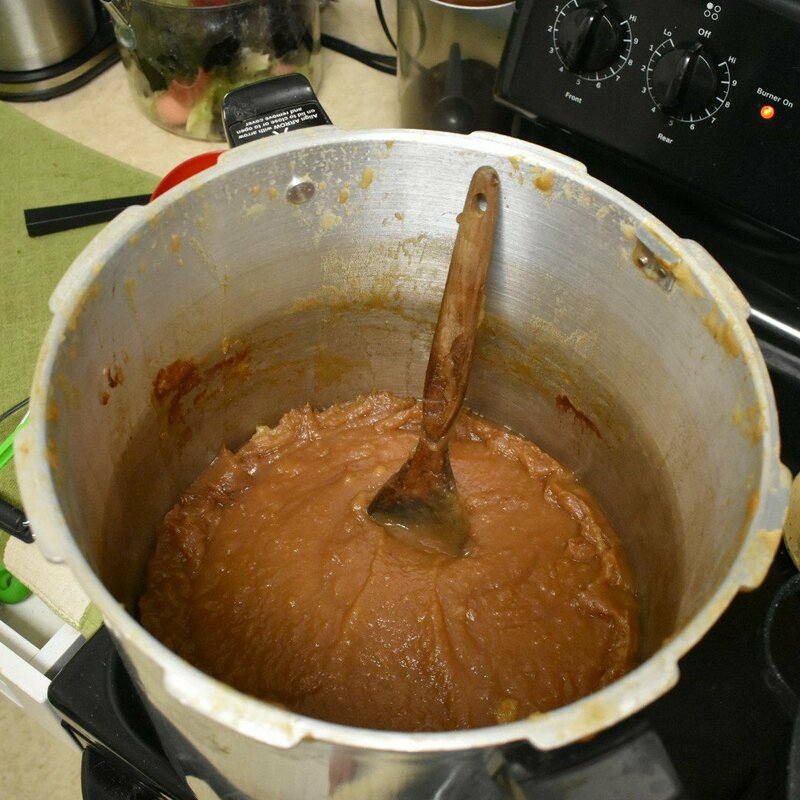 last year, i made a naked apple butter with no added sugar. it tasted fine but never achieved the butter consistency, even after 6+ hours on the stovetop. this year i opted to meet in the middle. i used a couple cups of raw sugar and some unfiltered cider along with 18 pounds of apples. and the holy trio of apple spices – cloves, cinnamon, and allspice. this year i also graduated to a fancy device that peels and cores the apples for you. 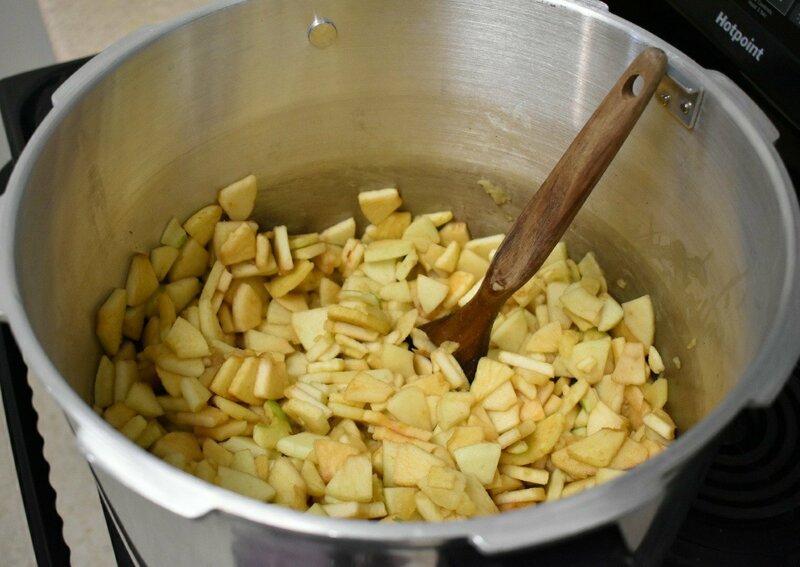 thankful i didn’t have to peel the 40+ apples that went into our 5 gal stainless steel pot. 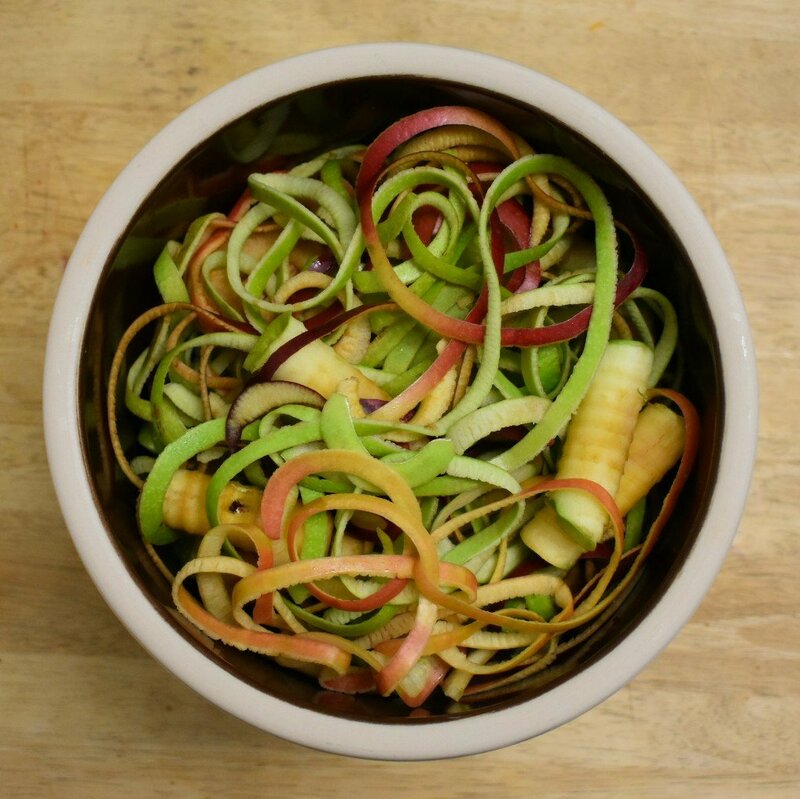 the peeler does the apple in one, long string. the green and red fruit strings mixed together seemed like something from doctor seuss. the peels and cores went into our 2 gal ceramic crock, were covered with some sugar and water, and will be left to ferment for a couple weeks into cider then vinegar. this is my first time making apple cider vinegar and i am hoping it works out. acv is one of the most important liquids in our home. i spray it on my face as a toner, use it in my hair as conditioner, drink it as a probiotic/ tonic, and make syrups and oxymels out of it, not to mention is culinary roles. i’m using the simple non-recipe from sandor katz’ wild fermentation. the butter cooked for 4 hours, sputtering molten lava drops that burned my face a couple times until i figured out i could cover the pot with some loose cloth. the house is autumn smelly and humid. the water bath canner always fogs up our kitchen windows. i think i actually like the canning process more than making the butter. i liked all the sterile jars lined up neatly. i like the silly tools that serve only one purpose like the magnetic wand that helps you pull lids out of the hot water. i like the satisfaction of all the jars, full of food, sitting quietly on a towel after the canning is over. after i admired the product of seven hours of work, i filled up my bathtub with a strong infusion of chamomile, lavender, lemon balm, roses, and calendula. i took the still hot water from the water bath canner and dumped it into the tub. andrew put on one of my favorite records, slept for lightyears by sparklehorse and turned a speaker to face our bathroom. 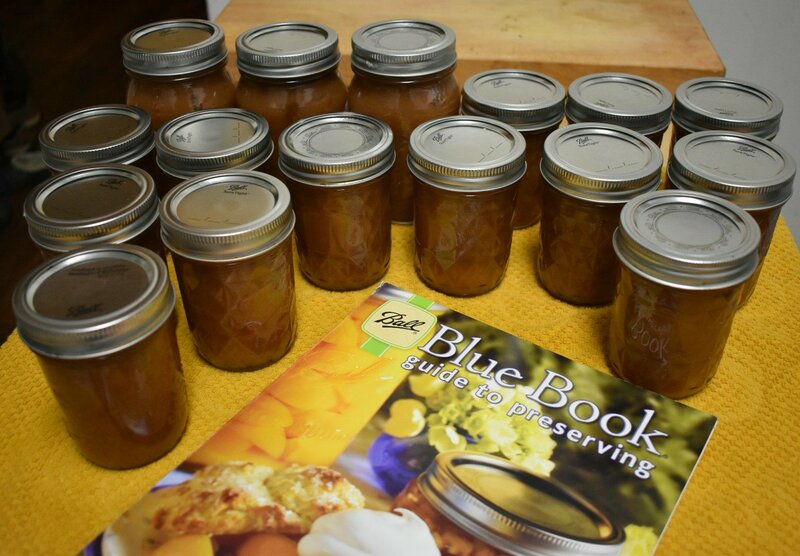 and then, at the end of this day where i made 16 jars of apple butter and this week where we brewed two batches of beer, i sunk into my tub, turned the lights dim, and let go. too bad we didn’t live closer ….I’ve canned for years, Jack’s Mom and the Ball Blue book were my teachers! I’m hoping to get back into that next summer. Nothing more gratifying than cooking or eating homemade!